The Ford Focus is produced in eight factories and sold in over 140 countries and sales have now topped 12 million in 16 years, so it’s fair to say the new Focus is an important car for Ford to get right or more importantly not to get wrong. 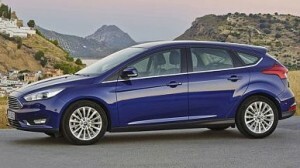 In a bid to not move too far from the blueprint of success this new Focus is actually a ‘facelifted’ version of the existing car. 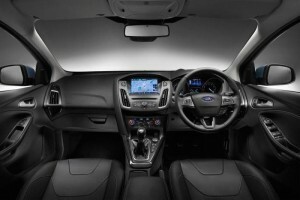 Externally the Focus has a new ‘Ford’ front with a flat nose, wide grille and sleeker headlamps, the rear has been given similar treatment with new bumpers and new light clusters and tweeks to the suspension and steering aim to improve the already class leading ride. Internally the Focus has ample room for driver and passengers but we would like to see a larger boot, 316 litres is a tad small, the Ford Fiesta has only 17 litres less and the Volkswagen Golf offers 380 litres. Technology plays a big part in desirability of new cars and the 8″ touchscreen, while smaller than the offering in the ‘car of the year’ Peugeot 308, helps clean up the previously cluttered dashboard and the voice activation Sync 2 system can be used to make phone calls, operate the audio output and even control the Sat Nav, where fitted. 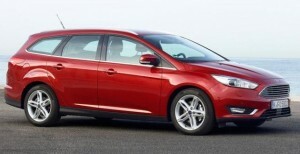 The Ford Focus Estate has the same wheelbase as the hatchback version so there is no extra space inside the car but the extended roofline increases the cars practicality with the boot size increased to 476 litres. The Focus Estate manages to not impair the Focus’s good looks and if anything it looks more imperious with the larger proportions. All Focus models come with stability control, air-con, digital radio, Bluetooth with voice control, ISOFIX child seat fitting and driver lumbar support. 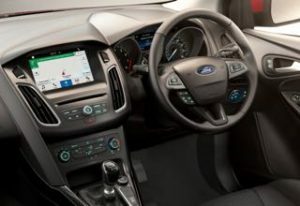 The Zetec Edition has 16-inch alloys, heated front windscreen, 8 inch touchscreen with SYNC 3 and Navigation, heated door mirrors and a leather-covered steering wheel. Go for the Titanium and you get a start/stop button, cruise control, rain-sensitive wipers, automatic headlight control, dual-zone climate control. The top-spec Titanium X adds power-folding door mirrors, active park assist, 17-inch alloys, part-leather trim, heated front seats, power operated driver seat, ambient lights, headlamp wash. The new ST Line offers sports suspension, a different design of alloy wheels and a subtle bodykit on the outside, plus a sports steering wheel, sports seats and alloy pedals in the cabin. The exterior styling mods include a rear diffuser and a lip spoiler, dark surrounds for the front fog lights and a honeycomb design for the front grille. There are two new engines for the Focus a petrol EcoBoost and a turbo diesel, both 1.5 litre in size, the 120 bhp diesel will rightly attract the most attention, capable of reaching 62 miles per hour in 10.5 seconds and return a claimed 74.3 miles per gallon with power delivery that is smooth. The 1.5 EcoBoost comes with either 150 or 182 bhp and can return a super 50 miles per gallon and the large hitting 62mph in 8.6 seconds but the realistic petrol option is the super one litre three cylinder petrol with either 99, 123 or 138bhp which is able to return 60.1 miles per gallon while still propel the focus to 62 miles per hour in 11.3 seconds in 125bhp guise or 10.4 with 138bhp. The excellent Powershift automatic gearbox is now available on a 1.0 litre 123bhp petrol engine that can return 51.4 miles per gallon which is a fantastic addition.